nanjIyar highlights that madhurakavi AzhwAr declares in the end that those who learn his prabandham will live in srIvaikuNtam which is fully under the orders of nammAzhwAr. nampiLLai and periyavAchchAn piLLai highlight that madhurakavi AzhwAr declares in the end that those who learn this prabandham will live in srIvaikuNtam. In the end, madhurakavi AzhwAr declares that those who learn this prabandham will live in srIvaikuNtam. him feeling agonized for him being unable to do anything in return to nammAzhwAr for his great favours (10th pAsuram). In this pAsuram, madhurakavi AzhwAr declares that those who learn and recite this prabandham will be favoured by nithyasUris in paramapadham. Though such devotees (of nammAzhwAr) are only desiring to be in AzhwArthirunagari, to fulfill the desires of nithyasUris, they would go to paramapadham and will enjoy nammAzhwAr there too. srIvaikuNtam (paramapadham) will be the residing place for the ones who firmly believe in this dhivya prabandham that is spoken with devotion by madhurakavi AzhwAr (me) towards nammAzhwAr who is devoted to all bhAgavathas who are dear to emperumAn who is partial towards his devotees. anban thannai… – emperumAn is affectionate towards everyone. As explained in srIrAmAyaNam yudhdha kANdam 30.56 “ripUNam api vathsala:” (srI rAma shows his motherly forbearance even towards one who considers him as his enemy). This is the true nature of Iswara/bhagavAn. thannai adainthavar… – nammAzhwAr is affectionate towards everyone who is surrendered to such emperumAn. This is nammAzhwAr‘s true nature. It is natural for everyone to be friendly with like minded persons. thenkurukUr… – It is the true nature of srI madhurakavi AzhwAr to be affectionate towards nammAzhwAr. This is said by madhurakavi AzhwAr after being induced by loving devotion towards him. nambuvAr… – For those who learn this prabandham, srIvaikuNtam will be their abode. This sounds contradictory. When nammAzhwAr is explained as the goal, should he not declare that AzhwArthirunagari is their abode? 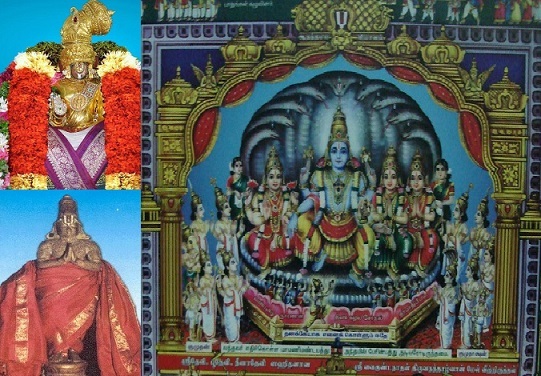 AzhwArthirunagari is under the control of polindhu ninRa pirAn and nammAzhwAr (Even the dhEvasthAnam is known as AdhinAthar AzhwAr dhEvasthAnam). But paramapadham is explained as the abode that is fully under the control of nammAzhwAr as in thiruviruththam 75 as “adiyAr nilAginRa vaikunthamO?” (Is this srIvaikuNtam the land that is fully controlled by the devotees? – as per vyAkyAnam). Another explanation. The place where those who learned this prabandham reside, that becomes srIvaikuNtam. nambi thiruvazhudhi vaLaNAdu dhAsar explains that after the birth of parAsara bhattar as the son of kUraththAzhwAn there is no barrier between samsAram and paramapadham since he destroyed the barrier and made them all a single abode. Thus ends nanjIyar‘s vyAkyAnam. nanjIyar thiruvadigaLE charaNam. anban – (without any other special qualifications/requirements) – he is naturally vathsalan (one who has vAthsalyam – motherly forbearance). His motherly forbearance is towards everyone irrespective of their attitude as explained in srIrAmAyaNam “ripUNam api vathsala:“. That is due to his eternal sambandham (relationship) with every one as explained in jithanthE sthOthram 2 “dhEvAnam dhAnavAnAm cha sAmAnyam adhi dhaivatham” (You are the common refuge to both dhEvas who are devoted to you and asuras who are against you). thannai adainthavarkatku ellAm anban – nammAzhwAr‘s affection is not common like bhagavAn‘s. His affection is specifically towards devotees as he himself says in thiruvaimozhi 3.7.1 “paramanaip payilum thiruvudaiyAr yavarElum avar kaNdIr emmaiyALum paramar” (Whoever has the wealth of devotion towards the supreme lord, they are my supreme lords). thenkurukUr nagar nambikku anbanAy – Not just stopping with bhagavAn, not just stopping with all his devotees but being affectionate to his own AchArya (nammAzhwAr). When there is personal expectation towards a goal, one will approach/serve bhagavAn. When there is desire to fulfill bhagavAn‘s expectation (only), one will approach/serve bhAgavathas. But when one desires to fulfill both bhagavAn and bhAgavathas’ expectations, one serves AchArya. AchArya is the goal since he is the one who reveals knowledge that is not known before. Subsequently, since he engages oneself in discussing about bhagavAn all the time and being a good companion in this world, he is the goal at that time. To attain ultimate goal of reaching bhagavAn, he is the purushakAra bhUthan (recommendation authority) – so he is the goal at that time. Finally, in paramapadham, since he is the one who nurtures bhagavath kainkaryam, he is the goal at that last stage also. nambuvArpathi vaikuntham kANminE – nambi thiruvazhudhi vaLanAdu dhAsar says wherever such persons (who have faith in madhurakavi AzhwAr‘s words) are, that place will become srIvaikuNtam. bhattar‘s explanation is explained here as repeated by nampiLLai as heard from peRRi (who is a contemporary of nanjIyar). Thus ends nampiLLai‘s vyAkyAnam. nampiLLai thiruvadigaLE charaNam. anban – Another pramANam for eternal relationship between jIvAthmA and bhagavAn is quoted from mahAbhAratham AraNya parvam 192.56 “sarvEshAmEva lOkAnAm pithA mAthA cha mAdhava:” (srIman nArAyaNan, the divine consort of srI mahAlakshmi, is the father and mother for every one). nambikkanbanAy – A couple of pramANams that show bhagavAn‘s affection towards his devotees are highlighted. bhagavAn himself says in gIthA 7.18 “gyAni thu Athma Eva mE matham” (such gyAni is only my AthmA and this is my philosophy). He also says in mahAbhAratham udhyOga parvam 74.27 “mama prANA hi pANdavA:” (pANdavas are my life breath). vaikuntham – To highlight that paramapadham is under the control of nithyasUris and mukthAthmAs, another pramANam is quoted from thiruvAimozh 3.9.9 “vAnavar nAdu” (the land of nithyasUris and mukthAthmAs – not said as the land of bhagavAn). nambuvArpathi vaikuntham kANminE – a pramANam is quoted for this from thiruvAimozhi 5.3.9 “uraikkavallArkku vaikunthamAgum thammUrellAm” (whoever recites (thiruvAimozhi), their residing place will become paramapadham). Thus ends periyavAchchAn piLLai‘s vyAkyAnam. periyavAchchAn piLLai thiruvadigaLE charaNam. anban… (full pAsuram summary) – In this pAsuram, nammAzhwAr, madhurakavi AzhwAr, the kaNNinuN chiRuth thAmbu dhivya prabandham and result of learning this prabandham somehow are explained. anban – bhagavAn is unconditionally affectionate towards everyone. sthOthra rathnam 10 explains “Evam nisargga suhrudhi – na chithramidham Asritha vathsalathvam” (Since you are doing so many favours towards everyone (irrespective of their state), there is nothing artificial/great in your motherly forbearance towards your devotees). He is explained as “sarvalOkaika vathsala:” (he is affectionate towards everyone in the universe), srIrAmAyaNam sundhara kANdam 21.20 “saraNagatha vathsala:” (one who is affectionate towards the ones who surrender unto him), srIrAmAyaNam yudhdha kANdam 30.56 “ripUNam api vathsala:” (srI rAma shows his motherly forbearance even towards one who considers him as his enemy). But more specifically, towards his devotees he even accepts their defects happily as mentioned in srIrAmAyaNam yudhdha kANdam 18.3 “…dhOshO yathyapi…” (I will never give up vibhIshaNa who approached me with friendly attitude even if he has defects. For good persons, such acceptance is not to be condemned). Even those who engage in unfavourable acts are cared with motherly forbearance by emperumAn as mentioned in sthOthra rathnam 63 “…prathibhavam aparAdhdhUr mugdha sAyujyadhObhU:…” (Even sisupAla who committed many offenses was pardoned by you and was given mOksham by you). Among all qualities of bhagavAn, this vAthsalyam (motherly forbearance) is the most glorified. It is because of this vAthsalyam, bhagavAn is glorified as supreme (since this quality in its truest sense cannot be seen in anyone else). And it is because of this quality, bhagavAn is approachable by everyone and is being the refuge for everyone. madhurakavi AzhwAr started with “kaNNinuN chiRuth thAmbinAl kattuNNappaNNiya perumAyan ennappan” in the first pAsuram explaining bhagavAn‘s qualities such as sausIlyam (easily mixing with everyone), saulabhyam (easily approachable), svAmithvam (supremacy), etc. And in the end, he completes with vAthsalyam separately since this quality is more special than any other qualities of emperumAn. anban thannai adainthavarkatku ellAm anban – starting to explain about nammAzhwAr. Unlike bhagavAn who is affectionate towards everyone due to his natural relationship with everyone, nammAzhwAr is affectionate towards everyone who is devoted to bhagavAn. Irrespective of such devotees’ birth, etc., nammAzhwAr is affectionate towards them. He himself says in thiruvAimozhi 3.7.8 “kumbi narakargaL EththuvarElum … em thozhu kulam thAngaL” (Even if one who lives in kumbI narakam glorified bhagavAn, those are considered as my masters) and in thiruvAimozhi 3.7.9 “eththanai nalam thAn ilAtha chandALa chaNdALargaLAgilum, maNivaNNARkALenRu uL kalanthAradiyAr tham adiyAr em adigaL” (Even though one is the lowest of a chaNdALa (dog-eater) with no good qualities, if he is fully surrendered to bhagavAn, such chaNdALa’s devotees are my masters). anban – nammAzhwAr will even give up bhagavath anubhavam to be with bhAgavathas. He himself says in thiruvAimozhi 8.10.7 “… avanadiyAr, nanimAkkalavi inbamE nALum vAykka” (instead of being with bhagavAn, I would like to have the association of his devotees only). thenkurukUr… – nammAzhwAr‘s attachment towards bhagavAn/bhAgavathas is due to his birth in this dhivya dhEsam. If the field is fertile, the crop will also be rich. nambi – One who is full in Athma guNams (essential qualities for a jIvAthmA). anbanAy – madhurakavi AzhwAr became devoted to nammAzhwAr seeing such Athma guNa pUrthi (complete in qualities). anbanAy madhurakavi – Just like nammAzhwAr is identified as bhagavAn‘s most loving devotee as he himself says in thiruvAimozhi 2.1.11 “ArAtha kAthal kurukuUrch chatakOpan” (satakOpa of AzhwArthirunagari, who has unfulfillable love towards emperumAn), madhurakavi AzhwAr is identified as nammAzhwAr‘s dear devotee. nammAzhwAr was focussed on praNavam (which explains jIvAthmA‘s svarUpam as a servant of bhagavAn) and nama: (which explains jIvAthmA‘s servitude towards bhAgavathas). madhurakavi AzhwAr is focussed on nama: exclusively. nambikku anbanAy madhurakavi – nambikkanbanAy – For the heart, there is love towards nammAzhwAr. madhurakavi – For the mouth/speech, there is sweet glorification of nammAzhwAr‘s qualities. nambuvAr – Instead of learning the meaning and ignoring it, having firm desire/faith in the meanings of these words, always engaging in reciting this prabandham, meditating on nammAzhwAr‘s glories that are revealed in this prabandham and feeling blissful, always wanting to hear the glories of nammAzhwAr from others, etc. nambuvAr – One who has firm faith that the glories of nammAzhwAr revealed in this prabandham are not false (exaggeration) and only truth. Thus ends azhagiya maNavALa perumaL nAyanAr‘s vyAkyAnam. azhagiya maNavALa perumaL nAyanAr thiruvadigaLE charaNam. Thus ends the English translation of kaNNinuN chiRuth thAmbu based on the wonderful vyAkyAnams written by nanjIyar , nampiLLai, periyavAchchAn piLLai and azhagiya maNavALa perumaL nAyanAr. This entry was posted in kaNNinuN chiRuth thAmbu, mudhalAyiram on February 21, 2015 by Sarathy Thothathri. nanjIyar highlights that madhurakavi AzhwAr mediates on nammAzhwAr‘s great favours towards him, realizes that he could not return such great favours and says that he immediately starts developing attachment towards nammAzhwAr‘s divine feet. nampiLLai highlights that madhurakavi AzhwAr meditates on nammAzhwAr‘s great favours towards him, realizes that he has not taken any steps towards nammAzhwAr and speaks the glories of nammAzhwAr‘s favours. It is explained in vishNu dharmam 70.78 “…kruthsnAm vA pruthivIm dhadhyAnna thaththulyam kathanchana:” (For the ones who give knowledge about bhagavAn and the means to reach bhagavAn, the whole world should be submitted. Even that will not match the favour done by such knowledge-bestower (AchArya)). Since AchArya gives bhagavAn himself to the sishya, only if there is another bhagavAn, the favour can be returned by the sishya. Thus, sishya will always be unsatisfied with his deeds towards his AchArya. periyavAchchAn piLLai highlights the same principle as that of nampiLLai. But instead of simply saying AchArya gives bhagavAn, he says AchArya gives the highest benefit – the divine couple (srI mahAlakshmi and srIman nArAyaNa). Only if the sishya finds another divine couple like that (which is impossible), he can return the favour to his AchArya and thus the sishya will always be unsatisfied that he cannot return the favours done by his AchArya. So far, nammAzhwAr‘s unique glories and the favours done by nammAzhwAr towards madhurakavi AzhwAr were explained by him. nammAzhwAr‘s glories which are contrary to his own defects and nammAzhwAr‘s great favours which are contrary to his own limitations were explained before. In this pAsuram, he realizes that he can never return nammAzhwAr‘s favours and becomes worried (that he cannot do that). In thaithriya bruguvalli 10.6, it is explained that “yO mA dhadhAthi sa i dhEvamAvA:” (one who gives me the supreme lord is my rakshaka (protector)). This feeling of gratitude will occur both in mumukshu stage (when being desirous of mOksham in this world) or muktha state (after reaching parampadham) and one cannot do anything beyond showing gratitude towards AchArya throughout one’s existence. It is the nature of AchArya to not expect anything in return and it is the nature of sishya to try to do something in return (for the great favours done by AchArya). But since nothing can be done matching the favours done by AchArya, he becomes very sad. Seeing the great favours, the sishya will desire to do something in return. But the greatness of the favours done by AchArya will make the sishya realize that such great favours cannot be returned since there is nothing as good as that (bhagavAn) which was given by AchArya. So, the only way to spend one’s time is by always worrying about not being able to satisfy one’s AchArya. Since AchArya reforms the AthmA, that AthmA can be submitted to bhagavAn. Even that cannot be done in the case of AchArya, since it was the AchArya who already reformed the AthmA and made oneself realize about one’s true nature. So, offering oneself is also not a fitting return for AchArya’s favours. Oh nammAzhwAr! who is living in AzhwArthirunagari which is surrounded by groves (gardens, etc) that are filled with the sounds of cuckoo, though there is no personal gain for you (by reforming others), and though they are not fit to be reformed, you reform them and engage them in (your) service through your strong instructions and deeds. I am trying to develop love and affection only to your divine feet (which is the best). seyal nanrAga – nammAzhwAr‘s easy approachability is such that, any one (irrespective of ones greatness/lowliness), one can approach him and accept his shelter unlike bhagavAn who is approachable only by the ones who have adhikAram (qualification). kuyil ninRAr pozhil sUzh kurukUr nambi – Even the cuckoos living in AzhwArthirunagari are joyfully singing – such is nammAzhwAr‘s simplicity (easy approachability). For bhagavath vishayam, one has to go to paramapadham to engage in sAma gAnam (singing of divine sAma vEdham) as mentioned in thaithriya bruguvalli 10.6 “Ethath sAma gAyannAsthE” (the liberated soul is singing sAma gAnam). For mukthas, the destination is paramapadham. But for mumkushus, the destination is AzhwArthirunagari. nammAzhwAr is enjoyed and relished by all including emperumAn himself, nithyasUris, mukthAthmAs, etc. payananRAgilum – In general, one helps another only for personal benefit. But nammAzhwAr helped me even though I would be of no real use to him. pAngallarAgilum – Even if there is no personal benefit, one would at least be able to follow the instructions. In my case, even that is not there since I am not qualified for anything good. payananRAgilum pAngallarAgilum – Even with these limitations, nammAzhwAr is unable to bear the suffering of such persons in this material world – that is why he is reforming them. Just like sIthA pirAtti instructed rAvaNa, looking at his pathetic state of being attached to worldly pleasure even though he was trying to harm her, nammAzhwAr is instructing me, to reform me. Even though a person may stay inside his home shutting all entrances (not to allow any one in), when that house is in fire, the on-lookers will naturally try to extinguish the fire. Similarly, even though one may not be qualified, nammAzhwAr instructs them still and reforms them. thiruththip paNikoLvAn – emperumAn is glorified in thiruvAimozhi 3.5.11 as “thIrntha adiyavar thammai thiruththip paNi koLLa valla” (One who is capable of reforming and engaging the devotees who accept bhagavAn as the prApyam (goal) and prApakam (means)) – but unlike bhagavAn, nammAzhwAr will reform even those who have not understood their true nature properly. kuyil ninRAr… – nammAzhwAr feels sad in separation from emperumAn like in thiruvAimozhi 8.5.2 “kANavArAy” (Please come and see me). He sometimes feels happy on meditating his relationship with emperumAn like in thiruvAimozhi 4.5.8 “yAvar nigar agal vAnaththE” (there is no one equal to me). During all these times, the cuckoos are with him, and they learn his pAsurams from him thus and repeat the same. kurukUr nambi – the complete person from AzhwArthirunagari. His completeness in auspicious qualities are such that, they even reform cuckoos (who don’t possess great intelligence to distinguish between chith (soul) and achith (matter)). He himself (in mother’s mood about her daughter parAnkusa nAyaki) says in thiruvAimozhi 6.7.2 “Urum nAdum ulagamum thannaippOl … pithaRRa” (She changed every one to be like her to be constantly uttering bhagavAn‘s names and glories). muyalginREn un than moy kazhaRku anbaiyE – I am trying to devote myself towards your most-praise-worthy lotus feet. madhurakavi AzhwAr is unable to comprehend how to show his gratitude towards nammAzhwAr, just like nammAzhwAr wondered how to show his gratitude to bhagavAn in thiruvAimozhi 2.7.8 “ennaith thImanam keduththAy unakken seygEn” (You have reformed me, how am I going to repay this favour of yours?). muyalginREn un than moy kazhaRku anbaiyE – Since he himself is not satisfied with his kainkaryam (service) towards nammAzhwAr, he prays that he develops more attachment towards nammAzhwAr‘s lotus feet. payananRAgilum pAngallarAgilum – Generally, an AchArya instructs only to a sishya who submits wealth, charity and renders service as mentioned in “arththO dharmatha: susrushuradhyAbya:“. 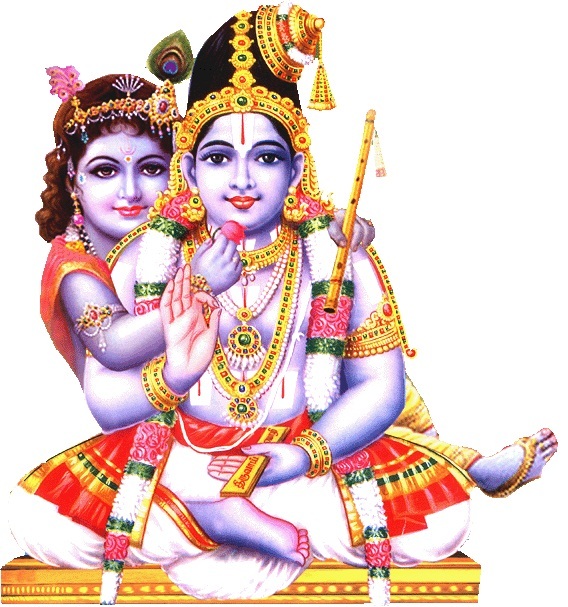 bhagavAn who is considered as niravadhika vathsalan (one who has infinite love/affection towards his children – all) himself instructed to arjuna only after he submitted himself fully as said in gIthA 2.7 “sishyasthEham sAdhi mAm thvAm prapannam” (I am your disciple and fully surrendered to you). But nammAzhwAr instructed me out of great compassion only due to my disqualification of learning anything. seyal nanRAgath thiruththi – Reformed me so that knowledge becomes fulfilled by practically following what is learned. Even kshathrabandhu who was reformed by a vaishNava (saintly person) attained the real goal only towards the end of his life, but I attained purity immediately. Reforming properly means – there should be sravaNam (hear from AchArya) first, mananam (meditating on what was heard) next, mahAvisvAsam (unflinching faith) on what was meditated upon, practically following those aspects which we have faith in, avoiding asadhanushtAnam (mis-deeds) and performing only sadhanushtAnam (deeds which are followed by pUrvAchAryas only). He himself ensured that I go through these steps and be reformed fully (instead of letting myself try it out). paNi koLvAn – Engaged in bhagavath, bhAgavatha kainkaryam (service to bhagavAn and his devotees). Once reformed, one should be engaged in kainkaryam. There should be bhagavath kinchithkAram (at least little bit of service to bhagavAn), AchArya kinchithkAram (at least little bit of service to AchArya) and vaishNava kinchithkAram (at least little bit of service to srIvaishNavas). To please AchArya, one performs kainkaryam to bhagavAn and bhAgavathas. To please bhagavAn and bhAgavathas, one performs kainkaryam to AchArya. All three are related and nourish each other. Among these three, bhagavath kinchithkAram is nirupAdhikam (natural) and bhAgavatha/AchArya kinchithkAram are sOpAdhikam (acquired). bhAgavatha kainkaryam is desired/acquired due to that being the ultimate goal. AchArya kainkaryam is desired/acquired due to one’s gratitude towards AchArya who shows bhagavAn and bhAgavathas. A true AchArya will first give proper instructions to the sishya, he will then himself practically demonstrate those instructions and will ensure that he becomes purer than himself. Only then such AchArya will be satisfied with the sishya and acknowledge him as qualified to do bhagavath/bhAgavatha kinchithkAram. kuyil ninRAr… – If the cuckoos in AzhwArthirunagari themselves are reformed (due to nammAzhwAr‘s sambandham) what to speak of me? Since he has madhura vAk (sweet voice/words), he glorifies AzhwArthirunagari in connection with cuckoos who have sweet voice. kurukUr nambi – one who is so complete that he would not expect anything in return for the great favours he has done. Even bhagavAn‘s favours can be re-paid, but AchArya’s favours can never be re-paid. moykazhal – Just like nammAzhwAr said in (the end of) periya thiruvanthAdhi 87 “moykazhalE Eththa muyal” (try to glorify bhagavAn’s lotus feet), here madhurakavi AzhwAr also says the same thing. Previously, madhurakavi AzhwAr said “ponnadi” in 2nd pAsuram highlighting the pure nature of nammAzhwAr’s lotus feet. In this pAsuram, the sweet/relishable nature of nammAzhwAr’s lotus feet is revealed. moykazhaRku anbaiyE – nammAzhwAr‘s most relishable aspect of lotus feet induced my love towards them. That love induced me to show my gratitude towards him. But I am most bewildered since I am unable to re-pay his favours. This bewilderment will go on forever. This entry was posted in kaNNinuN chiRuth thAmbu, mudhalAyiram on February 20, 2015 by Sarathy Thothathri. nanjIyar highlights that madhurakavi AzhwAr glorifies that nammAzhwAr‘s mercy of revealing thiruvAimozhi is more valuable for this universe than bhagavAn‘s mercy of revealing vEdham. nampiLLai and periyavAchchAn piLLai highlight that madhurakavi AzhwAr says “I will speak the glories of nammAzhwAr” since the glories of nammAzhwAr‘s mercy is greater than all the three thathvams (entities) namely chith, achith and Iswara. Hearing madhurakavi AzhwAr glorifying nammAzhwAr‘s mercy, some ask “While everyone is glorifying bhagavAn‘s mercy, why are you glorifying AzhwAr’s mercy?”, madhurakavi AzhwAr replies “bhagavAn‘s mercy is useful to attain the ultimate goal. But that ultimate goal is attained by first having gyAnam (knowledge). That knowledge is given by nammAzhwAr. That is why nammAzhwAr‘s mercy is greater than everything else”. prApthi (attainment of goal) is dependent on gyAnam (knowledge). But gyAnam is not dependent on the goal (i.e., knowledge does not occur after attaining the goal – it happens before hand). In the 4th pAsuram, madhurakavi AzhwAr expressed that he has many defects. In the 5th pAsuram, he explained his defects to be of two types (considering AthmA as independent, and being attached to worldly pleasures). In the 7th pAsuram, he mentioned that nammAzhwAr removed all his sins/hurdles. In this pAsuram, he explains how nammAzhwAr dispelled his sins/hurdles. Considering body as soul (not knowing difference between soul/body), and having attachment towards worldly pleasures (which is not fitting for the soul) are the hurdles that are removed through true knowledge about AthmA, bhagavAn and their relationship (this is called adhyAthma gyAnam/vidhyA). This knowledge will stop the accumulation of karmA. The already accumulated karmA will be removed by bhagavAn. AchAryan will remove the desires for more karmA. bhagavAn will remove existing karmA. bhagavAn removes karmA due to AchAryan giving the true knowledge. nammAzhwAr revealed the essence of vEdham for the pleasure of the devotees who glorify bhagavAn. nammAzhwAr, out of great mercy, compiled the 1000 pAsurams of thiruvAimozhi. This mercy of nammAzhwAr is very great in this world. Being blissful is the nature of devotees. Contemplating the grace of bhagavAn, the mukthas are always blissful as explained in mahAbhAratham sAnthi parvam 358.73 “hrushtA:” (mukthAthmAs are always worshipping bhagavAn and being blissful like the ones in swEtha dhvIpam). Being gIthAchAryan, bhagavAn revealed the most confidential principles of vEdham to uplift the ones who have even little bit inclination. Whatever was concealed by vEdham, he mercifully revealed them in gIthai. Note: nanjIyar alone attributes first 2 lines to bhagavAn revealing the principles of vEdham through gIthai. In all other vyAkyAnams, the pAsuram is fully attributed to nammAzhwAr. bhagavAn explained gIthai for the ones who are qualified to learn vEdham. nammAzhwAr explained the principles even for the unqualified ones. bhagavAn revealed it for the ones who were assembled in the battle field (only few benefited). nammAzhwAr revealed it for the benefit of all as mentioned in thiruvaimozhi 1.5.11 “pAlEy thamizhar isaikArar paththar paravumum Ayiram” (thamizh speaking persons, musicians/poets, devotees – all take refuge in these 1000 pAsurams) and in thiruvAimozhi 9.4.9 “thoNdarkkamudhuNNach chol mAlaigaL” (garlands made of nectarean words for the pleasure of devotees). aruL koNdAdum adiyavar – those who glorify bhagavAn‘s mercy like nammAzhwAr. nammAzhwAr in thiruvAimozhi 8.8.3 said “athuvum avanathu innaruL” (that is also his mercy only) and in thiruvAimozhi 10.6.1 “aruL peRuvAr adiyAr” (the devotees are blessed by bhagavAn). Other AzhwArs are also like him only. aruL koNdu – with mercy – nammAzhwAr did not sing on his own (whatever he felt like singing)- he sung based on the mercy of bhagavAn as said in thiruvAimozhi 1.1.1 “mayarvaRa madhinalam aruLinan” (bhagavAn blessed me blemishless knowledge/devotion). As explained in thiruvAimozhi 7.9.4 “ennAgiyE thapputhalinRith thanaik kavi thAn solli” (Through me, bhagavAn sung the glories of himself without any defect) – not only others, nammAzhwAr himself became blissful after compiling these pAsurams. inthamizh pAdinAn – even though he is giving the most complicated knowledge, he gave in such sweet thamizh language. ivvulaginil mikkathE – greater than chith (sentients), achith (insentients) and Iswara (bhagavAn) thathvams (entities). aruL koNdAdum adiyavar – those who glorify bhagavAn‘s mercy like nammAzhwAr. nammAzhwAr in thiruvAimozhi 8.8.3 said “athuvum avanathu innaruL” (that is also his mercy only). thoNdaradippodi AzhwAr says in thirumAlai 46 “AnaikkanRu aruLai Intha” (one who showed his mercy to gajEndhran/elephant). bhUthaththAzhwAr says in iraNdAm thiruvanthAdhi 56 “aruL purintha sinthai” (bhagavAn‘s merciful thoughts). periyAzhwAr says in periyAzhwAr thirumozhi 5.4.1 “ninnaruLE purinthirunthEn” (desiring for your mercy only). pEyAzhwAr says in mUnRAm thiruvanthAdhi 16 “aruLAthozhiyumE” (always merciful). 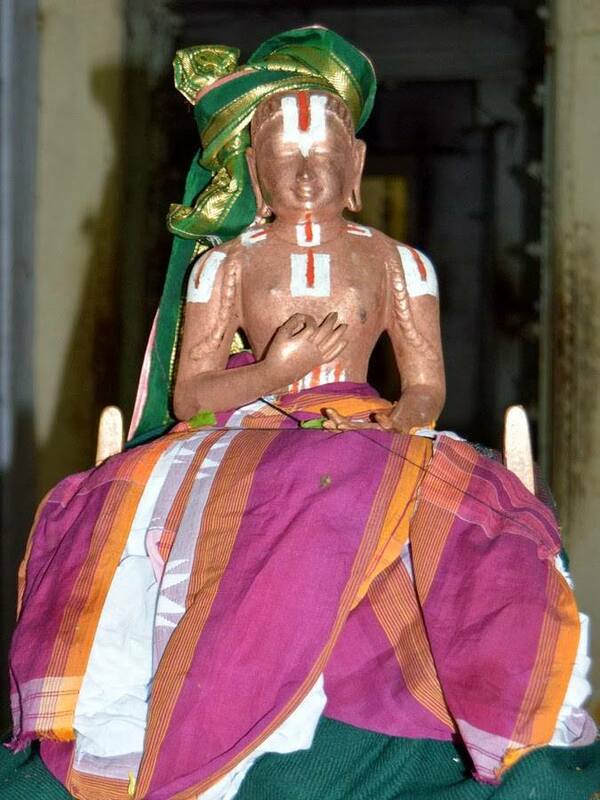 thirumangai AzhwAr says “AzhiyAnaruLE” (mercy of the one who holds sudharsana chakra only – srIman nArAyaNan). All these AzhwArs are fully situated in bhagavAn‘s prasAdham (mercy) and have no attachment in self-effort. arumaRai – vEdham which is very difficult to acquire/understand, i.e., the confidential/essence part of vEdham which is upanishadhs. The meanings of upanishadhs can only be understood by the ones who are situated in sathva guNam (pure goodness). For such persons, their wealth is that deep knowledge of upanishadhs. That too acquiring the knowledge by the grace of bhagavAn (not through self-effort). Such knowledge is blissful (inbuRa) as said in brahma sUthram 1.1.15 “thaththEthu vyapadhEsAchcha” (As bhagavAn is explained as the source for jIvAthmA‘s Anandham (they are different from each other)). Ayiram inthamizh pAdinAn – sung 1000 pAsurams. For the well-being of an AthmA, just one pAsuram from thiruvAimozhi is sufficient. But nammAzhwAr sung the most difficult principles in the manner that everyone can best relish. pAdinAn aruL kaNdIr – Such nammAzhwAr‘s aruL (mercy) is greater than bhagavAn‘s aruL since nammAzhwAr uplifts the jIvAthmAs that are given up by bhagavAn himself. aruL koNdAdum adiyavar inbuRa – nammAzhwAr sung thiruvAimozhi for the pleasure of sAthvikas (who are fully situated in proper knowledge) and not for the pleasure of bhagavAn. adiyavar – servants/devotees – ones who have sEshathva gyAnam (knowledge of servitude) – such knowledge must lead to kainkaryam (service). aruL koNdAdum adiyavar – those firmly believe that for such kainkaryam, bhagavAn‘s mercy is the sAdhanam (means/process). mercy is upAyam (means) and kainkaryam is purushArththam (goal). Ones who glorify bhagavAn‘s mercy more than any other of his qualities. They glorify mercy more since when there is mercy, bhagavAn‘s other qualities will be worthy, but when there is no mercy, other qualities will become useless. Just like bhagavAn is more glorifiable than dhEvathAntharams (other dhEvathAs), bhagavAn‘s mercy is more glorifiable than his other qualities. bhagavAn‘s krupai is required for sakthan (one who is capable to engage in karma, gyAna, bhakthi yOgams) and asakthan (one who fully surrenders revealing his incapability). For karma, gyAna, bhakthi yOgam followers, bhagavAn looks at their difficult efforts, have mercy on them, becomes pleased and fulfills their desire. For prapannas, they reveal their Akinchanyam (having nothing in their side) and bhagavAn shows mercy on them to fulfill their desires. To show that bhagavAn uses his mercy to uplift others, two pramANams are quoted – nammAzhwAr himself says in periya thiruvanthAdhi 26 “aruLennum thaNdu” (stick named mercy) and thirumangai AzhwAr says in periya thirumozhi 6.2.4 “aruLennum oL vAL” (sword named mercy). Since nammAzhwAr has brAhmaNyam, he uses the example of stick and since thirumangai AzhwAr has kshAthram (warrior qualities) he uses the example of sword. In arumpadham, it is explained that nammAzhwAr is said as brAhmaNa due to his tranquil nature – the most advanced/peaceful state of understanding brahmam clearly. inbuRa – even though these sAthvikas know that mercy is the way to get bhagavAn‘s benediction, they are blissful to hear the same from nammAzhwAr. When others recommend/speak about our favourite, we will be naturally pleased. arumaRaiyin poruL – maRaiyin arum poruL (most important meaning of vEdham) that is mercy is the means and kainkaryam is the goal. poruLai aruLinAn – Since nammAzhwAr would not recite vEdham as it is (due to his varNam), he is revealing the meanings of the same. While the vEdham itself cannot be learned/recited by chathurtha varNam (sUdra), everyone can learn/speak the meanings of vEdham irrespective of their varNam. Ayiram inthamizh pAdinAn – Unlike praNavam which is very short and mahAbhAratham which is very long, he sung 1000 pAsurams in beautiful thamizh. pAdinAn – nammAzhwAr sang – vEdham is apaurushEyam (not written/compiled by any individual) and is considered as the highest pramANam. But if compiled by individuals, will these be pramANam? If these were sung out of nigraham (disgust), it would not be pramANam. But as nammAzhwAr himself says in 7.9.3 “Am mudhalvan ivanenRu thaRRERRi en nA muthal vanthu pugunthu nalli kavi thUmuthal paththarkkuth thAn thannaich chonna en vAy muthal appanai” (selecting me (nammAzhwAr) as the chosen/leading one, bhagavAn gave me full knowledge, being seated in my tongue, compiled beautiful poems on himself which are most enjoyable for mumukshus), it was bhagavAn‘s own words which came through him in a joyful manner – so it is a valid pramANam. aruL kaNdIr ivvulaginil mikkathE – nammAzhwAr‘s mercy is great and well-known in this world. Not the pAsuram, not the one who compiled the pAsuram (nammAzhwAr), not the mercy of the one who blessed nammAzhwAr to compile the pAsuram (bhagavAn) – but nammAzhwAr‘s mercy is greater. inthamizh pAdinAn… – Not the mercy of bhagavAn who gave the difficult gIthai, but the mercy of nammAzhwAr who gave the sweetest thiruvAimozhi. Not gIthai, which is spoken by bhagavAn independently, but thiruvAimozhi which is spoken by nammAzhwAr by the grace of bhagavAn. inthamizh pAdinAn aruL kaNdIr ivvulaginil mikkathE – As said in thiruvAimozhi 10.6.11 “kEttArAr vAnavargaL sevikkiniya senchol” (the people of paramapadham wants to hear thiruvAimozhi again and again), paramapadham is filled with nammAzhwAr‘s pAsurams. Similarly, this samsAram is filled with nammAzhwAr‘s mercy. 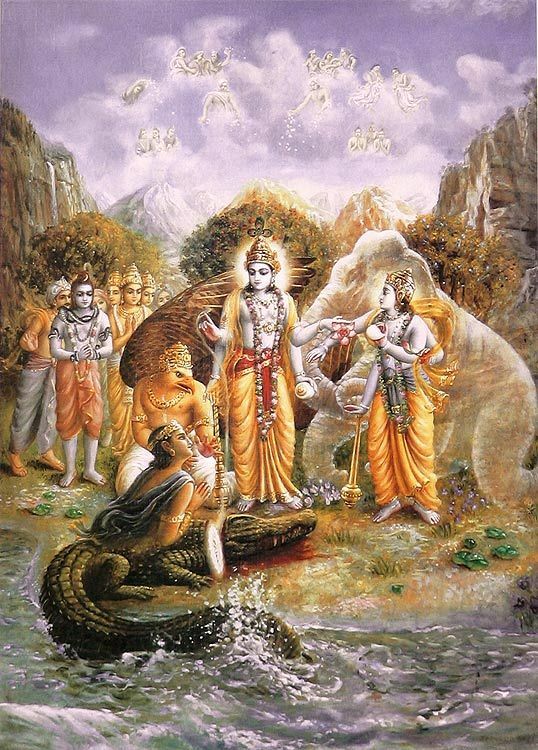 Ayiram… – No one performs anjali as soon as hearing the name of krishNa who spoke gIthai. But as soon as we hear thirukkurukUr (the birth place of nammAzhwAr), we perform an anjali (as part of thiruvAimozhi sEvAkAlam, in the last pAsuram of each pathikam (decad), we perform anjali hearing nammAzhwAr‘s name or his birth place thirukkurukUr). kaNdIr – this is obviously visible. bhagavAn‘s mercy is to be understood from sAsthram, but nammAzhwAr‘s mercy is obviously visible for us to see. We can see it here in this world itself – need not wait until we reach paramapadham. This entry was posted in kaNNinuN chiRuth thAmbu, mudhalAyiram on February 12, 2015 by Sarathy Thothathri. nanjIyar highlights that madhurakavi AzhwAr reveals his desire to spread the glories of nammAzhwAr who dispelled all his hurdles (sins) out of his unconditional grace. nampiLLai highlights that madhurakavi AzhwAr being blessed by the unconditional grace nammAzhwAr , wants to speak the glories of nammAzhwAr to everyone who are suffering in this material world. periyavAchchAn piLLai highlights that madhurakavi AzhwAr being blessed by the unconditional grace nammAzhwAr , wonders why all the people of this world who are eligible to get that grace are not getting lifted. He realizes it is due to the lack of awareness about nammAzhwAr‘s glories and reveals that he will speak about the glories so everyone becomes aware of it. In the 4th pAsuram, madhurakavi AzhwAr explained that though great sages rejected him, nammAzhwAr blessed him with his grace as a mother/father. In the 5th pAsuram, he reveals his defects. In the previous pAsuram, he says that nammAzhwAr will never give up on him going forward and has blessed that he will sing nammAzhwAr‘s glories forever. In this pAsuram, madhurakavi AzhwAr says that nammAzhwAr also mercifully removed all the hurdles (sins) in him which have been there since time immemorial. Thus, he says, he will spread nammAzhwAr‘s glories everywhere. madhurakavi AzhwAr practically demonstrates the injunction in sAsthram “gurum prakAsayEnnithyam” (always spread the glories of guru/AchArya). nammAzhwAr had full understanding in bhagavAn‘s supremacy, dhEvathAntharams not having any supremacy, bhAgavatha sEshathvam (being devoted to devotees of bhagavAn), having no attachment in worldly desires, etc. Yet, he looked at the sufferings of samsAris (worldly people) and out of great mercy towards them, he instructed them about the true knowledge starting from thiruvAimozhi 1.2 “vIdu min muRRavum” upto thiruvAimozhi 10.5 “kaNNan kazhaliNai” padhigams. Even though bhagavAn is filled with unsurpassed mercy, since he is supremely independent, he may punish the ones who approach him seeing their defects. But nammAzhwAr will never do that. This aspect is discussed by madhurakavi AzhwAr in this pAsuram. nammAzhwAr, the auspicious son of poRkAri, being the one who has done great favours to me having glanced me with his divine blessings and engaged me in his service. He drove away my eternal sins that have been following me since time immemorial. I will speak the glories of the mercy of nammAzhwAr who is the abode (source) of beautiful thamizh pAsurams (poems), to the people of eight (all) directions and make them realize (his glories). Like nammAzhwAr said in thiruvAimozhi 8.7.2 “irunthAn kaNdu koNdu” (emperumAn stayed in my heart looking at me with great love), here madhurakavi AzhwAr says “nammAzhwAr stayed there mercifully glancing at him”. paNdai valvinai – time immemorial – the origins of these strong sins not traceable. Since there is an end for the AthmA in this samsAram (as there is an opportunity to reach paramapadham), it might be inferred as having a start in samsAram (but since the existence of AthmA in this samsAram is said as anAdhi in sAsthram, there is no beginning for these sins). These sins are neither atonable nor exhaustible by experiencing the fruits of the same (meaning it will take forever). nammAzhwAr removed all those sins. He even removed the attachment towards bhagavAn since that is a hurdle for bhAgavatha kainkaryam (which is the ultimate goal). eNdisaiyum aRiya iyambukEn – I will speak this to both knowledgeable and ignorant people. oNdamizh – Instead of being samskrutham/vEdham as said in “yathO vAchO nivarthanthE” (words/mind could not understand), this is easily understandable thamizh (dhrAvida vEdham). “satakOpan aruLaiyE” – nammAzhwAr‘s aruL (mercy) even captured the ones (me) who missed out bhagavAn‘s aruL (mercy). kArimARap pirAn – Out of gratitude, madhurakavi AzhwAr calls nammAzhwAr as pirAn (one who does great favours). Specifically says “kArimARap pirAn” to distinguish from bhagavAn who is normally glorified as pirAn. paNdai valvinai – Many ancient hurdles such as attachment towards material desires, approaching bhagavAn in improper ways like sUrpaNakA, considering kainkaryam to bhagavAn as the ultimate goal, etc. pARRi aruLinAn – dispelled them completely as mentioned in sAtyAyana sAkai “dhvishantha: pApakruthyAm” (fruits of sins/vices are distributed to ones enemies while going to paramapadham). endisaiyum aRiya iyambukEn – Preaching to all who have the desire towards this matter. Like nammAzhwAr said in thiruvAimozhi 5.2.2 “thoNdIr ellArum vArIr” (all devotees are welcome), madhurakavi AzhwAr also invites everyone following the footsteps of nammAzhwAr. kaNdu koNdu – On seeing me nammAzhwAr was so happy like finding a treasure as I am the most suitable recipient (filled with inauspiciousness) for his mercy (which is great). ennai – one who was so ignorant and did not even know the difference between nammAzhwAr and other samsAris (materialistic people). Me who would not even comprehend nammAzhwAr‘s unconditional grace. kARimArap pirAn – bhagavAn himself says in gIthA “suhrudham sarva bhUthAnAm” (I am the well-wisher of everyone) – but nammAzhwAr‘s favours are even greater. oNdamizhch chatakOpan aruLaiyE – oLLiya thamizh – beautiful thamizh. His aruL (mercy) towards me is greater than him singing thiruvAimozhi which was the refuge of great devotees. nammAzhwAr‘s auspicious qualities are highlighted in the beginning of this pAsuram’s commentary. gyAnam (knowledge), bhakthi (devotion), virakthi (detachment) and krupai (mercy) are some of his main qualities. gyAnam is focussed on thathva thrayam (chith, achith, Iswara) – i.e., he is fully knowledgable in the three entities. bhakthi is focussed on Iswara, i.e., being devoted to bhagavAn only. virakthi is focussed on chith and achith, i.e., being detached from self enjoyment and material pleasures. But beyond all of these he is filled with krupai towards others. His mercy is even greater than bhagavAn‘s and that is explained in this pAsuram. kaNdu – Like it is said in mahAbhAratham sAnthi parvam 358.73 “jAyamAnam hi purusham yam paschEth madhusUdhana: …” (by the divine glance of madhusUdhanan emperumAn, the AthmA is blessed in the womb), nammAzhwAr blessed me with his divine glance. koNdu – Seeing my defects, still he accepted me. ennaik kaNdu, ennaik koNdu – He bestowed his vision on me (who should not be seen due to my defects), accepted me (who was given up by everyone). Due to his acceptance, even bhagavAn has to accept me. kArimARap pirAn – he is not a pirAn like bhagavAn who is svayambu (without any origin), he is the son of kAri (who comes in a very nice family which is devoted to bhagavAn). pARRi – changed/dispelled my hurdles. Unlike bhagavAn who said in gIthA 18.66 “mAmEkam saraNam vraja … mOkshayishyAmi” (surrender unto me, I will remove your hurdles), he already removed my hurdles without me surrendering unto him. endisaiyum… – I will preach his glories to people who are considering themselves as independent and to those who are considering dhEvathAntharams will protect them. aRiya iyambukEn – will speak so they know – as periyAzhwAr said in thiruppallANdu 4 “nAdu nagaramum nangaRiya” (to make people of towns and cities realize). I will speak about nammAzhwAr‘s mercy, how it materialized in my case, how my hurdles were dispelled and how I am blessed with singing the glories of nammAzhwAr. srI jAmbavAn glorified bhagavAn after he completing thrivikrama avathAram in “dhEvA: svasthAnamAyAnthi dhaithyA: sarvE hathA gathA: | na bhayam vidhyathE kinchith jitham bhagavathA jagath ||” (dhEvas are returning to their places. asuras are killed. there is no more fear. the world is won over by bhagavAn). Here madhurakavi AzhwAr glorifies nammAzhwAr. There bhagavAn’s strength/power is glorified. Here nammAzhwAr‘s compassion is glorified. There prayOjanAntharaparars (dhEvas – ones who are looking personal favours) benefited. Here ananyaprayOjanars (prapannas – ones who are looking to serve bhagavAn/bhAgavathas) benefited. There bhagavAn‘s mischief is revealed. Here nammAzhwAr‘s (pure) nature is revealed. This entry was posted in kaNNinuN chiRuth thAmbu, mudhalAyiram on February 9, 2015 by Sarathy Thothathri. In the last two pAsurams, svAmi aruLALa perumAL emberumAnAr explained the foolish acts of people who disregard their own AchAryan and indulge in their own pursuits to reach perumAL who is there in unseen, distance place, with the hopes of having HIM as the refuge. pAsurams 33 and 34 (paRRU guruvai and etta irundha) dealt with this with specific analogies to it. In this pAsuram, svAmi aruLALa perumAL emberumAnAr explains the fact that to such a person who does not have any affection to his AchAryan, even perumAL would not do anything helpful, rather would punish him for his foolish acts. anRum then HE (sriman nArAyaNan) will get angry and destroy the person. enRum: The phrase means “always” / “forever” that includes past, present and future. Iram sei nAraNanum: nArAyaNan is ever compassionate to all souls at all times. The word “nAraNanum” signifies the inseparable nature of existence between the soul (jIvAthmA) and perumAL. The word “nAram” would include all jIvAthmAs that can encompass both living and non-living beings. The word “ayanam” in nArAyaNan would mean that HE (nArAyaNan) stands as the life of all jIvAthmAs. Without HIM, there is no question of existence of anything. HE is the sustaining force as well as driving force behind everything. This meaning is one of the important meanings conveyed in the word “nArAyaNan” that is to be split as “nAra” and “ayana”. This point was told in “undhanOdu uravEl namakku ingu ozhikka ozhiyAdhu” by sri AndAl in thirupAvai pAsuram #28. svAmi thirumazhisai azhwar also described this in his pAsuram “nAn unnai anRi ilEn kandAi nAraNanE!!! nI ennai anRI ilai”. Hence, we can see that it is HE (nArAyaNan) who is inside both conscientious and non-conscientious entities and HE is the one who stands as the driving force behind them. So, because HE pervades in every little thing, HE sees the innumerable mistakes that they comitt yet still HE treats them as blessing rather than a blemish. This quality is known as vAsthsalyam which can be inferred by the etymological evaluation of the name “nArAyaNan”. So, it is HE who does shower on HIS infinite mercy and compassion to all living and non-living things at all times/forever. anRum: The verb “anRudhal” would mean to get angry. In this context, it would mean that sriman nArAyaNan would get angry. The act of HIM getting angry is itself a punishment whereas the act of HIM being pleased is a blessing. The same word can be seen in periya thirumozhi pAsuram prhase “anRiya vANan” which carries the same meaning as this one. The second half of the pAsuram goes ahead and explains on what circumstances would such an ever compassionate sriman nArAyaNan gets angry. than Ariyan pAl anbozhiyil: The circumstance that is being referred in the previous paragraph is when a person has no bhakti at all towards his AchAryan. As explained in the last two pAsurams (“etta irundha guruvai” and “paRRU guruvai”), if a person dismisses his AchAryan as just another human being and disregards him as a mortal with the thought that he is not the supreme god, then that is an act of utmost foolishness. Continuing on the same thought, if a person were to disregard and dismiss his AchAryan as a human and have no bhakti towards him, then even sriman nArAyaNan HIMSELF gets angry at such a person. This point is being explained through an exceptional analogy that is dealt subsequently. ninRa punal pirindha pangayathai: The analogy given is of a beautiful lotus flower that dwells on water such a pond or a lake etc. If such a lotus were to be seen outside the water, then the ensuing events happening to it are described. pongu sudar veiyOn: Sun, as we know is something that is flaming hot, bright and dazzles with brightness. As kulasEkharAzhvAr puts it “sengamalam andharam sEr vengadhirOrkku allAl”, a lotus flower would not blossom to anyone apart from the sun. If one were to create an artificial light in order to make the lotus blossom, he would fail miserably as the lotus would not blossom to any light except the natural sun light. When the lotus is inside the water, the sun would keep on helping in its blossom. This entry was posted in gyAna sAram, Other on February 7, 2015 by santhanam rajagopalan. One’s AchAryan is very much accessible and easily approachable to his sishyAs. However, if a person were to disregard such an AchAryan with a pretext that he is still a human and would go ahead and perform the most difficult yOgam etc. in order to see perumAL, thinking that HE will be of help when he needs HIM, this act is nothing but ignorance. This point is being illustrated in this pAsuram as well with an example. eRRe what a foolish / ignorant act!!! paRRu guruvai: This describes the qualities of an AchAryan to whose lotus feet a person surrenders. AchAryan is someone who is very easily approachable, one who mixes and mingles with us very amicably, one who is very pleasant to interact and one who protects us. paran anRu enRu igazhndhu: AchAryan is none other than sriman nArAyaNan HIMSELF in human form. If a person were to dismiss such an AchAryan as just another human being and disregard him as not a manifestation of god, the impact of such a foolish behavior is being elaborated in this pAsuram. maRROr paranai vazhippadudhal: To worship another one apart from one’s own AchAryan. The one that is reference here is none other than perumAL sriman nArAyaNan HIMSELF. HE is very difficult to reach by one’s own efforts. HE is not to be seen by one’s naked eyes. HE is not so easily attainable through yOgams etc. If a person goes behind such a perumAL as the ONE who protects him forever and one who will be pleasant to interact with, disregarding his own AchAryan, it is very foolish says svAmi aruLALa perumAL emberumAnAr. eRRe! : This is an exclamatory remark. svAmi aruLALa perumAL emberumAnAr weighs out both AchAryan that a person had ostracized and perumAL and lets out a sigh, looking at the pitiable and foolish state of this particular person who had disregarded his AchAryan. He says “eRRe” with a lot of pain and loss of hope towards this person. Then he goes ahead and gives an analogy to this situation. than kaiporuL vittu: A person throws away his money that he has in his pockets. He has saved that money in his pocket in order to use it when the need arises. ArEnum kAsiniyil thAm pudaitha: This person goes ahead and hunts for a treasure that he believes would be there underground. He believes that someone some time ago might have buried some treasure here and goes to dig it up in order to use that a source of funds to meet his timely needs. apporuL thEdi thirivAn aRRu: Hence, the act of such a person that is being reference above in the “treasure” example above is being compared to the act of a person who disregards his own AchAryan and goes ahead to find perumAL sriman nArAyaNan somewhere. “thirivAn” strictly would mean the person but in this context it points to the act of such a person rather than the person himself. It is called “thozhil uvamam” in thamizh grammar. அருகில் இருப்பவனாய் எளியவனுமான ஆசார்யனைப் புறக்கணித்துவிட்டு மிகத் தொலைவில் இருப்பவனுமாய்க் கிட்டுதற்கு அரியவனுமான இறைவனை ஆசைப்படுவார் அறிவிலிகளாவர் என்று இரண்டு உதாரணங்களால் (எட்டவிருந்த, பற்றுகுருவை) என்ற 33, 34 பாடல்களால் காட்டப்பட்டது. ‘இவ்வாறு குருவினிடத்தில் அன்பு இல்லாதவனுக்குப் பகவான் ஒரு நாளும் அருள் பண்ண மாட்டான். தண்டித்தே தீருவான் என்பதை உதாரணத்துடன் உணர்த்துகிறது இப்பாடல். என்றும்: எக்காலத்திலும், அதாவது கழிவு, நிகழ்வு, எதிர்வு ஆகிய முக்காலங்களிலும் என்று பொருள். அன்றும்: சீறுவான் ‘அன்றுதல்’ சீறுதல் தண்டனை செய்வான் என்று பொருள். ‘அன்றிய வாணன்’ (பெரிய திருமொழி -1275) என்றவிடத்தில் அன்றிய என்ற சொல் கோபித்த என்ற பொருளில் வழங்கியது போல இங்கும் அப்பொருளில் வந்தது. எப்பொழுது இவ்வாறு அக்கருனைக் கடலான இறைவன் சீறி எழுவான் என்றால் அதைக் கூறுகிறது மேல் தொடர். தன்னாரியன்பால் அன்பு ஒழியில்: தன குருவினிடம் பக்தியில்லையானால் (சீறுவான்) அதாவது கீழே எட்டயிருந்த குருவை‘ பற்று குருவை’ என்ற இரண்டு பாடல்களிலும் குருவின் மனிதத் தோற்றத்தைப் பார்த்து இவன் இறை அன்று என்றும், ‘பரன் அன்று என்றும்’ நினைத்து விட்டு விடுதல் கூறப்பட்டது. அவ்வாறு குருவினிடம் அன்பு அகன்றால் என்று பொருள். இதற்குத் தக்க உதாரணம் மேல் தொடரால் சொல்லப்படுகிறது. நீன்ற புனல் பிரிந்த பங்கயத்தை: மிக்க ஒளியுடையவனும் உஷ்ண கிரணங்களை உடையவனுமான சூரியன். அதாவது ‘செங்கமலம் அந்தரம் சேர் வெங்கதிரோர்க்கு அல்லால்’ என்று குலசேகராழ்வார் சொன்னதற்கிணங்க அதாவது தாமரை சூரிய ஒளிக்கல்லாமல் வேறு ஒளிக்கு மலராது என்பது இயல்பு. நீரைப் பிரியாமல் இருக்கும் பொழுது எக்காலத்திலும் தன்னுடைய கிரணங்களால் அலற்த்திக் கொண்டு வரும் சூரியன். தனக்கு மந்திரோபதேசம் செய்த ஆசார்யனிடம் அன்பு அகன்றால் எல்லா உயிர்களுக்கும் கருணை காட்டும் நாராயணனும் கூடச் சீறிவிடுவான் இது எது போன்றது எனில் தண்ணீரை ஆதாரமாகக் கொண்டு நின்ற தாமரையை அத்தண்ணீரைப் பிரித்துக் கரையில் சேர்த்தால் அத்தாமரை உஷ்ண கிரணங்களையுடைய சூரியன் அனலைக் கக்கி உலர்த்துவது போன்றதாம். அதாவது சீடனுடைய உயிர் தத்துவத்தை விளங்க வைக்கும் இறைவனே குருபக்தி குலைந்ததும் தண்டித்துவிடுவான். சீடனின் நல்லறிவை மறைத்து அறிவிலியாக்கி விடுவான். சீடன் அறிவுடையவனாக இருந்து அது இல்லாதவனாகிவிடுவான் என்ற கருத்து ‘ உளரெனினும் இல்லாரோடொப்பர்.’ என்று வள்ளுவர் கூறியது போல் குருபக்தி குலையக் கூடாது என்பதாம். இப்பாடலில் கூறிய கருத்தை ஸ்ரீவசனபூஷணத்தில் “தாமரையை அலர்த்தக் கடவ ஆதித்யன் தானே நீரைப் பிரித்தால் அத்தை உலர்த்துமாப் போலே ஸ்வரூப விகாசத்தைப் பண்ணும் ஈஸ்வரன் தானே ஆசார்ய சம்பந்தங்குலைத்து வாடப் பண்ணும்” என்று கூறியுள்ளது காண்க. This entry was posted in gyAna sAram, Other, thamizh on February 7, 2015 by sundara varadan. மிகவும் எளியனாய்த் தனக்குக் கிடைத்திருக்கிற ஆசார்யனை மானிடத் தோற்றத்தாலே புறக்கணித்து மிக அரியனாய் யோகங்கள்முதலிய அநேக முயற்சிகள் செய்து காண வேண்டிய இறைவனை வேண்டிய சமயத்தில் நமக்கு உதவுவான் என்று நினைத்து அவனைப் பின்தொடர்தல் அறியாமை ஆகும் என்னும் கருத்தை மேலும் ஒரு உதாரனத்தாலே இதி சொல்லப்படுகிறது. பற்று குருவை: தன்னாலே பற்றப் பட்டிருக்கிற ஆசார்யனை. அதாவது மிக எளியனாய்த் தனக்கு வேண்டும் போது தன்னைக் காக்கும் துணையாகவும் பழகுவதற்கு இனியனாகவும் தன்னால் குருவாகப் பற்றப்பட்டிருக்கும் ஆசார்யனை என்று பொருள். பரன் அன்று என இகழ்ந்து: ஆசார்யனை பகவானுடைய தோற்றமாகச் சொல்லி இருக்க, அதில் நம்பிக்கை கொள்ளாமல் மானிடவன் என்று கருதும் தீய எண்ணத்தினால் ‘இவன் பகவானுடைய தோற்றமில்லை மனிதனே ‘ என்று சிறுமை செய்து அவனைப் புறக்கணித்து. மற்றோர் பரனை வழிப்படுதல்: வேறு ஒரு இறைவனை வழிபடுகை.அதாவது ‘மிகவும் அரியனாய்த் தன் கட்புலனுக்குத் தோன்றாமல் யோகம் முதலிய அரிய முயற்சிகள் செய்து மிக வருந்திக் காணத்தகும் இறைவனைத் தனக்குக் காவல் துணையாகவும் பழக இனியனாகவும் நினைத்து அப்பரனை அடைவதற்காக அவனைப் பின் தொடர்க’ என்பதாகும். எற்றே: என்னே! இரக்கப் பொருளில் வந்தது. இவன் புறக்கணித்த ஆசார்யனுக்கும் பற்றிக்கொண்ட இறைவனுக்கும் உள்ள வேறுபாட்டைக் கருத்தில் கொண்டு மனவேதனையுடன் என்னே! என்று மனம் நொந்து கூறும் கருத்தைக் காட்டுகிறது. எற்றே– என்னே என்று இளி வரவில் வந்த இடைச் சொல். இது எது போன்றது எனில். அப்பொருள் தேடித் திரிவான் அற்று: அவன் புதைத்த பணத்தை தான் அடைவதற்காகப் பூமியைத் தோண்டித் தோண்டித் திரிபவன் செயல் போல என்று பொருள் (திரிபவன் போல என்பதற்குத் திரிபவன் செயல் போல என்று பொருள் சொல்லப்பட்டது)மற்றோர் பரனை வழிபடுதல் என்னும் செயலுக்கு உதாரணமாகச் சொல்லுவதால் தேடித் திரிபவன் செயல் போல என்று கூறப்பட்டது. இதுவும் தொழிலுவமம் ஆகும். ஆகவே அருகிலுருக்கும் குருவைப் புறக்கணித்துவிட்டுக் காண முடியாது நெடுந்தொலைவிலிருக்கும் கடவுள் பின் செல்லுதல் தன கையிலுள்ள பொருளை அற்பம் என்று எண்ணி உதறிவிட்டு யாரேனும் பூமியில் பணத்தைப் புதைத்து வைத்திருக்க மாட்டார்களா என்று பேராசையுடன் பூமியைத் தோண்டித் தோண்டித் திரிகின்ற அறிவிலியின் செயல் போன்றது என்று மன நோவுடன் ஐயோ என்று இரங்கிக் கூறுவதாக அமைந்துள்ளது இப்பாடல். இப்பாடல் கருத்தை ஸ்ரீவசனபூஷணத்தில் ‘ கைப்பட்ட பொருளைக் கைவிட்டுப் புதைத்த பொருளை கணிசிக்கக் கடவனல்லன்’ என்று கூறியுள்ளது காண்க. This pAsuram explains how foolish a person can be when he disregards his AchAryan as human. In addition to this, he goes ahead and reaches out to perumAL sriman nArAyaNan who is somewhere so far, and thinks that HE will come to help HIM when in need. This person is doing something foolish and this is being illustrated with an analogy. etta irundha guruvai: The word “ettudhal” would mean to catch hold off and thus connotes with “adjacent” or “nearby”. In this context it would describe the AchAryan who is so near to a person. In addition to geographical proximity, the nearness would also describe the AchAryan as someone who can be seen with our naked eye (unlike perumAL), someone who protects us when we need protection, someone who is very sweet, someone who is always helping out for the betterment of the soul and finally someone with whom we can talk and mingle. He is so close to a person. iRai anRenRu vittu: This is to discard or dismiss one’s AchAryan as just another person. svAmi aruLALa perumAL emberumAnAr describes that a person would dismiss his AchAryan and not take him as his master. Instead of adhering to “charnAgathi thandha than iRaivan thALE (31st pAsuram)”, i.e., to treat one’s AchAryan’s lotus feet as everything, a person may disregard his AchAryan completely and regard him as just like one among the innumerable persons that he meets every day. Thus, he would not treat him as his master. Or paranai virupuRudhal: The person, who disrespects his AchAryan would look out for perumAL sriman nArAyaNan, who is beyond anyone and is somewhere out of his reach. This perumAL is someone whom even the shAsthrAs do not completely, ONE who is somewhere distant and ONE who is very difficult to reach. The person would yearn out to reach such a perumAL, with the thought that HE is the protector and is very sweet to him. svAmi aruLALa perumAL emberumAnAr describes a beautiful analogy to compare the actions. thankaN sembaLithirundhu: This would mean to close the eyes like a person who is sleeping, without knowing the impacts of it. kaithuruthi nIr thUvi: When in thirst, a person would drink water from the can he has. He would have already filled it with water. However, if in thirst, a person throws away this water away into the ground. The fact illustrated in this pAsuram is being reflected in srivachanabhUshanam in the choornikai “vidAi piRandhapOdhu karasthamAna udhagathai upEkshithu jImUtha jalathayum, sAgara salilathayum, sarith salilathayum vApI kUpa payasukalayum vAnjikka kadavan allan”(srivachabhUshanam #449).